Photo by: T'xer Zhon KhaUSA TODAY NETWORK-Wisconsin. Cranberries are sorted at Wetherby Cranberry Co., in Warren, before they're shipped to grocery stores in Wisconsin and Minnesota. Wisconsin's cranberry growers would be grateful if you piled on an extra helping or two of cranberry relish on your plate this Thanksgiving. That's because they're facing a glut of the fruit this fall. Wisconsin’s annual cranberry harvest starts with a flood as berries float on the surface of a bog, pumped full of water, before they’re raked out in a seasonal ritual that’s just been completed. This year, though, there’s been a flood of another kind in a surplus of cranberries that will result in about 25 percent of the crop being discarded, even spread on fields as fertilizer, to protect growers’ prices. The U.S. Department of Agriculture authorized the industry to withhold a large portion of berries from the market so the supply will get back in balance with the demand. Hundreds of millions of pounds of the tart fruit could be used as fertilizer or animal feed. Some of the glut could be donated to charities or sold overseas to keep it out of the U.S. marketplace. “Basically, they’re going to destroy 25 percent of the crop,” said Paul Mitchell, a University of Wisconsin-Madison agricultural economist. It’s something the growers, themselves, requested from the USDA through what’s called “volume regulation,” a rarely used federal order to deal with an oversupply of fruit. Much of the 2017 crop is still in storage, compounding the problem as this year’s bountiful harvest comes to market. “It’s a sign of how bad of shape the industry is in, that they’re actually using crop destruction to try and help farm income,” Mitchell said. “It’s the best choice they face, but it’s not the choice they want,” he added. Wisconsin is the nation’s leading cranberry producer, harvesting more than 60 percent of the country’s crop, according to the Wisconsin State Cranberry Growers Association. The little red berry, Wisconsin’s official state fruit, is the state’s No. 1 fruit crop in volume and economic value. The cranberry, once called “crane berry” by settlers because of its blossom’s resemblance to the sandhill crane, was first harvested in Wisconsin around 1860. Today, more than 250 growers produce the berries in central and northern areas of the state. In many areas of agriculture, including berries, farmers have gotten better at producing higher volumes of commodity crops, to the point where the market becomes saturated and prices fall below the costs of production. “It’s a broad problem in agriculture now. Generally what we’ve done in the past is export our excess. And that’s worked because there are a lot of hungry people out there,” Mitchell said. But export opportunities have withered for many U.S. crops, especially for soybeans this year, as China implemented steep tariffs on American beans in retaliation for President Donald Trump’s tariffs on foreign steel, aluminum and billions of dollars in other products. Cranberries, too, have been caught up in the trade wars with additional tariffs from Canada, Mexico, the European Union and China. 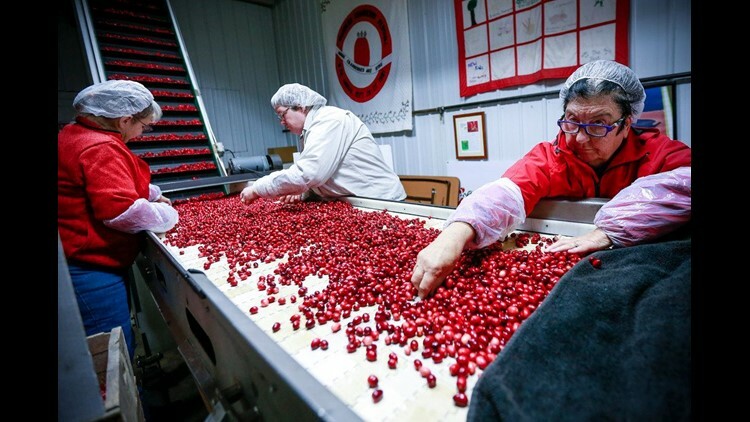 China slapped a 40 percent tariff on American cranberries this year, up from 25 percent, according to growers. “And even if Trump hadn’t screwed around with tariffs, some of these issues would still be there because the rest of the world is getting better at producing as well,” Mitchell said. Canada and Chile, for example, have ramped up cranberry production with large, highly efficient bogs and improved varieties of fruit. “Our marshes are older, and it’s expensive to upgrade,” Mitchell said. And there’s already an oversupply of berries in the U.S.
“I think we have roughly a year’s worth of cranberries in storage right now. That’s why growers have turned to the marketing order to do a 25 percent crop destruct,” Mitchell said. That mechanism has only been used a handful of times since the 1960s, according to growers. But it’s allowed under the Capper-Volstead Act passed by Congress nearly a century ago, which exempts farmers from certain antitrust laws. Cranberry growers, as a group, can petition the USDA for permission to withhold a percentage of their harvest from the market – a move that would be illegal in other industries. The agency previously ordered 15 percent of the 2017 crop be diverted as prices had fallen below the 35 cents per pound cost of production for growers, according to the USDA. “Many growers are definitely under a lot of financial pressure because the last few years have been bad in terms of income,” Mitchell said. Profit margins “are thin to negative for most farmers,” he added. Wisconsin, Massachusetts, and New Jersey are the nation’s top cranberry producers. This year’s Wisconsin harvest, while good, probably won’t be a record-breaker, according to growers. Because the crop is “a little bit short” this year, it will help with the oversupply problem, according to Tom Lochner, executive director of the Wisconsin State Cranberry Growers Association. Growers don’t savor the notion of their crop, which costs them a lot of money and hard work to produce, being spread on fields as fertilizer. “I don’t think there are any farmers who like to grow food and not have it used in a consumer product,” Lochner said. But, growers say, sometimes it’s necessary to dump part of a crop to keep them in business. “Our inventories have been building the last five or six years. Our ability to grow the crop has outpaced our ability to sell it,” Lochner said. Weather is a factor in every growing season, so farmers can’t easily predict what their crop will be like at harvest time. Domestic and foreign markets fluctuate, and some years there’s a shortage, not a surplus, of berries. And while cranberry growers submitted their “volume regulation” request to the USDA in August 2017, hoping to get an answer before this year’s growing season started in the spring, they didn’t hear back from the agency until this fall. “Growers were already well into the harvest. They didn’t have any choice but to grow a normal crop and wait on the USDA decision,” Lochner said. This year’s marketing order doesn’t apply to all cranberries, including organic fruit. Processors, known in the industry as “handlers,” that take in fewer than 125,000 barrels are exempt from the withholding requirement, along with handlers who don’t have a carryover of fruit from last year. Much of Wisconsin’s cranberry crop goes to Massachusetts-based Ocean Spray. The company didn’t return a Milwaukee Journal Sentinel call asking about its plan to dispose of excess cranberries. Wetherby Cranberry Co. says it’s not covered by the federal order because its berries aren’t shipped to Ocean Spray. “The smaller handlers are really not involved because they didn’t accumulate that much volume,” said Nodji Van Wychen, whose family operates the 110-acre cranberry marsh. It will be up to the handlers, not individual growers, to get rid of the surplus of cranberries, according to Van Wychen. “It’s not going to be the fresh product that is going to be disposed of. It’s going to be mostly the accumulated (cranberry) concentrate,” she said. Wetherby has been growing cranberries since 1903. In early November, the operation is sorting and packaging berries that will be shipped to grocery stores in Wisconsin and Minnesota for Thanksgiving. “There’s a big push right now, so we are going fast and furious,” Van Wychen said. Through University of Wisconsin research, the cranberry industry has developed cranberry vines that produce two or three times more fruit than older vines. But is that necessarily helpful, given the industry has been swamped with berries? “It could be questionable. But it’s good as long as our marketing and advertising can sustain the amount that we grow. That’s the key to the whole situation,” Van Wychen said.